Each year Make your Mark release a ballot paper of the biggest issues that effect young people across the UK! 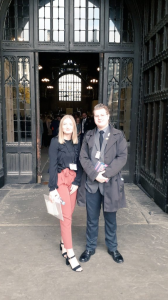 After the debate we (MYPs) voted for the 2 issues we would like to carry forward for our campaigns in 2019; firstly lets rewind on how I ended up here in the first place… Anyone who knows me will understand my love and passion for young people having a voice, but equally my lack of knowledge in politics. So when I was asked to become an MYP earlier on in the year my first answer was no. After thinking about it an realising I attend all of the Make Your Mark events anyway and the role wasn’t heavily politically influenced, I had the chance to be the voice of my constituency, I finally said yes. Unfortunately, I only came to this realisation in October… the debate was in November! During the half term, all of the Welsh MYP’s went on an overnight residential for debate training in Cardiff. This was such a confident booster for me because I was genuinely scared and I mean so scared. 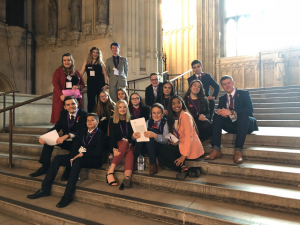 I was worried that all the other MYP’s had met and worked together before and that my lack of interest in politics would leave me at a disadvantage. I couldn’t of been more wrong! We were all in such a similar boat and immediately when I got there everyone just clicked. When it came to going to London on Thursday 8th November we were all at another level of nervous. For many of the MYP’s, like myself, it was our first time attending the annual debate. We all had speech and debate practice previously and were EXTREMELY familiar with the 5 issues, but had never been in this situation before. We arrived at London after a long, long bus journey and stayed in the London YHA. I stayed with the 3 loveliest and most supportive girls I’ve ever met. We shared statistics, ideas and criticism with each other for ages when we first got there and had a well-deserved meal and walk around London in the evening. Friday came and 8am we were up and ready to go. I was so nervous I couldn’t eat and I think everyone was feeling the same. To be fair to all of us, we scrubbed up well! We got to the Commons and after a million and one photographs we had made it! I honestly rang my brother to tell him that I was having a cup of tea in the House of Commons and had never felt more British. The time came for the actual debate and we were led into the chambers. Wales took their seats on the back benches and I couldn’t quite believe we were there, the place you see MP’s and Prime Ministers on the TV. In the morning session we debated Votes at 16, Homelessness and Equal Pay for Equal Work. Each debate had the same structure, there was a chosen debate lead to begin the debate with an argument for why this should be our priority campaign, then Mr Speaker (John Bercow) would invite the opposing argument against the motion. That’s when the debate really begins and one person from each area in the UK has their say on what they think of the motion. For Votes at 16 Samuel Taylor spoke, for Homelessness was my roommate Lauren Taylor and on Equal Pay For Equal Work was Thomas Vaughan-Jones. In the afternoon session another roommate of mine Ushenka spoke on Mental Health and the last debate my third and final roommate Charley spoke on why Knife Crime should be our priority campaign. Unfortunately, I didn’t have the opportunity to speak as it is difficult to get the speakers attention. I would of liked to have spoken on Mental health as I believe this is the most important motion proposed on the ballot paper. I am hoping to be an MYP next year and have this opportunity again, this is if I am elected to represent RCT again. Not only were we celebrating the 10th sitting of the Youth Parliament but Votes 100. 100 years ago this week the vote was given to some women and all men. Some very passionate and powerful women gave speeches remembering the women who fought for the right to vote for women. 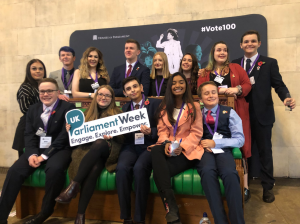 As a Youth Parliament we were described as the most “diverse group of people to ever sit in the Commons”. Down to the incredible variety of race, religions, genders and sexualities it was remarkable to be a part of! After the vote, our campaigns for 2019 are now Votes at 16 and Putting An End to Knife Crime. I would like to thank so many people behind the scenes of the event such as BYC and the House of Commons itself. I owe so much to Children in Wales for taking me and making sure everyone was safe and had fun. Most importantly I would like to thank my Youth Worker, Andrew Burrows, without whom I would never even considered being an MYP. Thanks to his persistence and belief in me I would not of been able to be the best I could be. He has supported me through the entire process and even had to put up with me for a whole 3 hours on the bus! Thank you so much and I really hope I can be even better next year! The Welsh MYPs wanted to VLOG their experience over the 2 days. Click the link below to watch. All footage is from staff and young people .